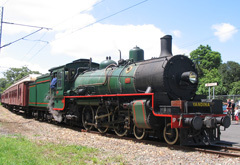 Do you want sound for your model railway layout but have been put off by the complexity of DCC or the high prices of sound equipped locomotives? Well, Soundscape CDs may be the thing you've been looking for. Quite a few people buy my regular audio CDs simply to have some appropriate sounds for their layouts, well now I've taken that a step further. 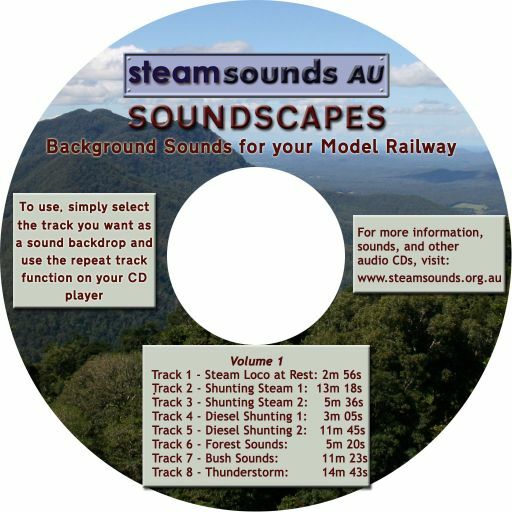 This series of CDs are intended as sound "backdrops" for your model railway and feature a series of tracks of different scenes that you can play through a conventional CD player. There is nothing fancy about the technology, I have just mixed some scenes using either multi-track techniques, or have single tracks which provide an ambience of a particular environment. To use these CDs, all you have to do is stick them into a CD player, select the track you are interested in, then, if your CD player supports it, select the repeat track option and it should continue playing giving you some suitable background sounds. The tracks do not fade in or fade out to assist in smoothing out the repeat, but this is also dependent on the CD player. To keep the costs down, there aren't any track notes with these, but that means they don't get lost either! I have put some notes on each of the tracks lower down on the page to help you see if they are suitable, plus a couple of clips to listen to. Note I have faded these in and out just to go easy on your ears. To purchase these CDs, either click on the links below, or you can purchase them through Rail Pictures (http://www.trainpictures.com.au/). To buy online, click on the Buy Now button according to which postage you require below. All orders are processed through PayPal, so if you have an account with them, well and good, and if not, don't worry, as all major credit cards will work too. If either of these options aren't suitable, please feel free to contact me using the Contact Me page here to arrange other payment options. To Purchase, please click on one of the Buy Now buttons below, depending on whether you live in Australia, or overseas. This track features the sound of a loco waiting in between services, with the Westinghouse pump ticking over occasionally, with the odd wheeze and hiss of steam. Featuring C17 802 at Imbil. Just the thing for sounds around an engine shed. Here we have the sounds of numerous steam locos at work, including BB18 1/4's, C17's, PB15's and an AC16 sitting quietly waiting her turn. Would suit quite a busy yard and a variety of locales, as I deliberately removed most whistles to keep the engines anonymous! In this track, ex Victorian Railways Y class 133 provides some nice EMD 567 chant as a suitable backdrop for your diesel shunting yard. Any period from the 50s until the late 80s would be a suitable era for this track. 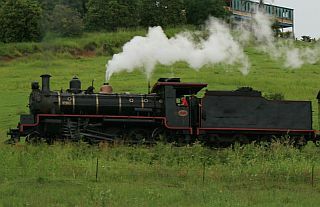 Recorded on a visit to Puffing Billy in 2005, the sounds of a rainforest can be used to spice up that dense vegetation on your layout. The quintessential sounds of the Australian bush are in this track, with the sounds of crows, crickets, birds and other bush sounds. This came from some recordings I did while waiting for a train in the Little Liverpool Ranges, west of Ipswich.